chapter XVII: What a GREAT Cause! I LOVE this idea - National Belly Laugh Day! It's coming up on January 24th. Learn about it here. 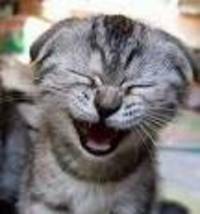 I mean if a cat can laugh, what is stopping you? I work with young companies. I particularly like education companies (especially companies like tutor.com and dimensiou.com). My specialty is finance/stategy/day to day operational combat.